The 200-05108 Wind Monitor-HD has important features that greatly extend the service life of this popular sensor. 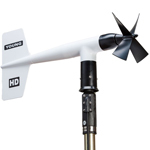 It promises improved survivability for the most severe wind measuring applications. The reliability of the Wind Monitor sensor is well known. The sensitive vane and propeller combination has proven effective for countless applications in many disciplines. The Wind Monitor-HD (Heavy Duty) model is designed to address the most common concern of mechanical wind sensors: bearing replacement. The HD utilizes extremely long-wearing, oversize ceramic bearings to increase service life many times longer than standard stainless steel bearings. In addition to being more wear-resistant, ceramic is resistant to corrosion in environments that are hostile to steel bearings. 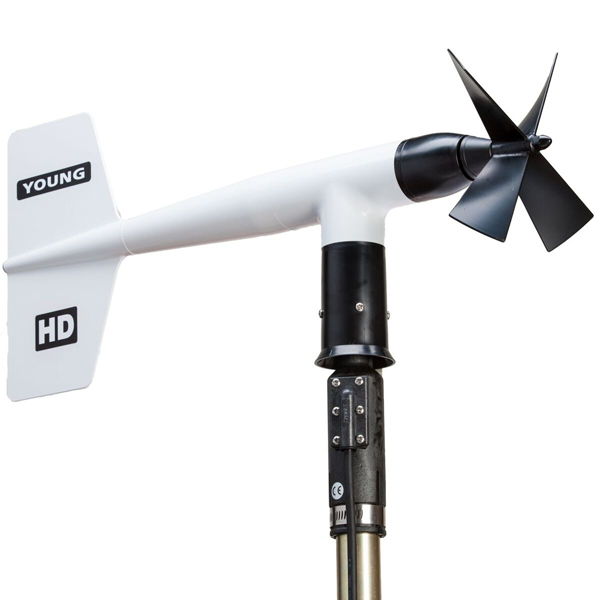 The Wind Monitor-HD also has oversized propeller shaft, high pitch propeller and stainless steel locking propeller nut, all features that will enchance long-term reliability of the sensor.